Everyone tends to get highly superficial when it comes to things that go into their mouths. Just like natural selection in the human world, the selection of foods we consume has alot to do with colours. Come on, there’s no need to deny the fact that you like good-looking food. We all do. It helps that the curry chicken is of a fiery orange red hue, and the punnet of strawberries, a deep crimson red. 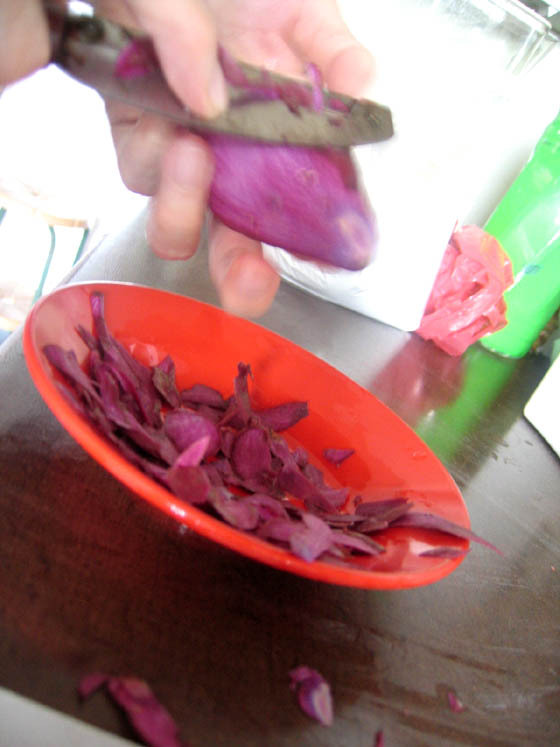 Foods have colours attached to them. You wouldn’t expect a chocolate brownie to be green would you? Likewise, I don’t think you’d be expecting a green steak when you order a medium rare ribeye. 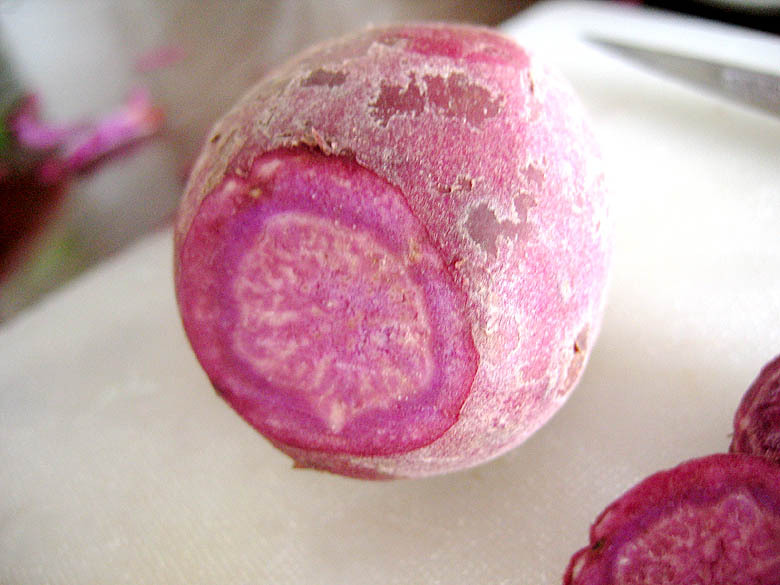 However, it is fun to expect different colours when you know it’s a food that’s fun and cool. A food like onde onde. 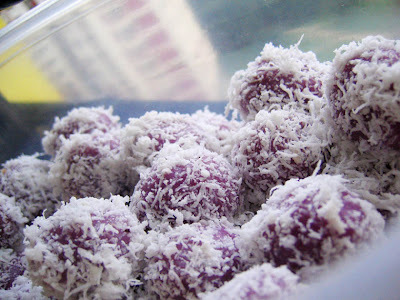 We all know onde onde and most of us like it because of the oozing molten gula melaka (palm sugar) that squirts out if we bite too hard. Made out of glutinous rice flour, these mini balls usually come in green. But the green is usually not from natural colouring. Onde onde is something that I love making because you get to see the balls developing from being a mere dough to something soft and sticky and filled with sweet lava. Ever since I came across an onde onde recipe that used sweet potatoes, I got hooked. Adding sweet potatoes to your onde onde dough just gives it a softer bite. 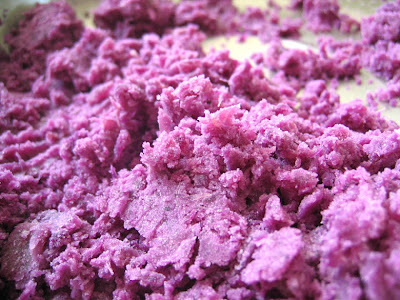 The texture is pleasant and not so tough on your jaws – you need not chew as if it was bubble gum. The previous times that I made these sweet potato onde onde, I used the traditional sweet potato we all know and love – the orange ones. Orange onde onde seems to be passe because I’ve discovered how cool it’ll be to have purple onde onde. The most amazing thing is that it’s au naturel. 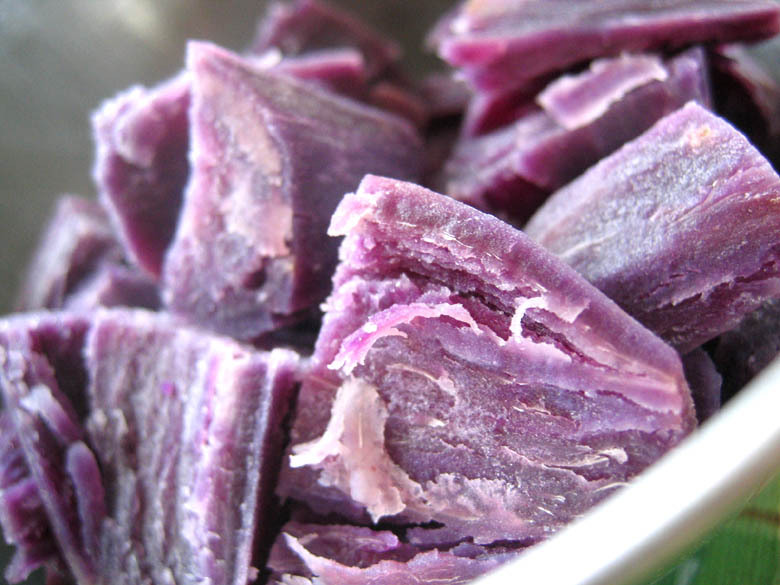 If orange sweet potatoes give you orange onde onde then purple sweet potatoes gives you purple sweet potatoes no? hahaha… yes, it’s quite obvious. I kid you not! I didn’t dye these potatoes. They’re just purple by nature. As purple as can be, and as purple as grapes and my retainer box. Try as I might, I couldn’t shake off that look of awe on my face as I mashed the potatoes before adding them to the glutinous rice flour. Trust me, there was no drop of artificial colouring. None, zilch, zero! Just 100% purple sweet potato. 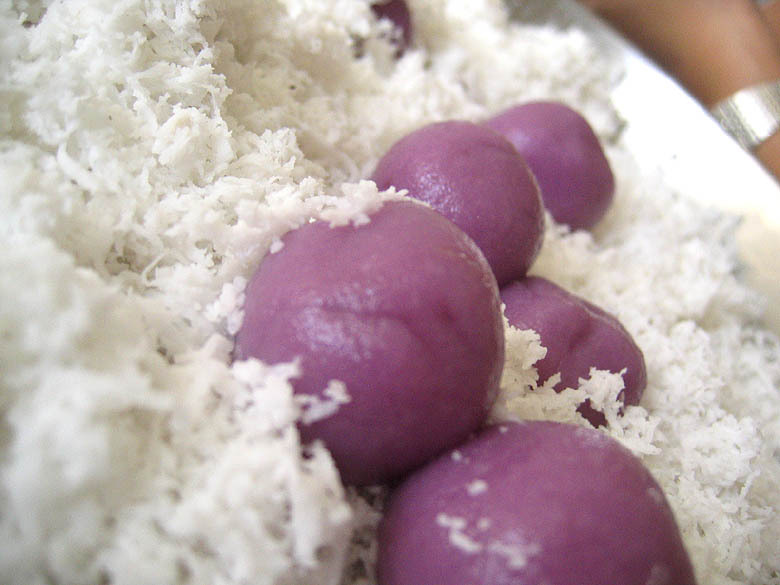 Go here for the onde onde recipe.